It is really unwise of me to write this post when I’m hungry because it is all I can do to keep myself from running out the door and getting to Drumbar as quickly as possible. Formerly known as Czech Point, Drumbar morphed into a Scottish Pub this past spring and wisely kept the to-die-for Pork Knuckle on the menu. I must have ordered it at least ten times since moving to Malmö and each time I am in carnivorous bliss when it arrives at the table. Admittedly I have no idea how the rest of the food is at the restaurant (although I overheard someone saying they have the best haggis they have ever eaten) because I can’t bring myself to pass over one of my all time favorite meals. Basically I try and find any excuse I can to justify my next pork knuckle. When we have guests, I take them for the knuckle. When I turned 40, I celebrated with a pork knuckle. When we happen to be in Lilla Torg (the little square), I’m always saying “how about a pork knuckle?” The beer-braised, caraway studded, crispy-on-the-outside-perfectly-moist-on-the-inside beast of a meal easily feeds two people. I always feel a bit like a dog with a bone when it arrives and I don’t want to share, but half way through I am grateful for help because it is just too good to be wasted. Our little 2 and 4 year old carnivores love the knuckle too. With a side order of fries or mashed potatoes it is enough food to feed the four of us. The plate is rounded out with sauerkraut, boiled potatoes, a red wine sauce, two kinds of mustard and freshly grated horseradish. And although I’m not much of a beer drinker, this meal begs for it. 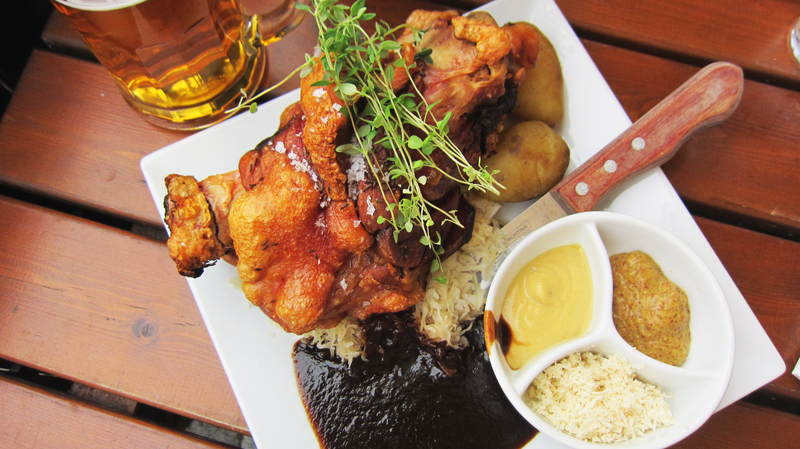 One crispy bite transports me to the outskirts of the Vienna Woods to an Austrian beer garden shaded by grape arbors where I experienced my first pork knuckle five years ago. 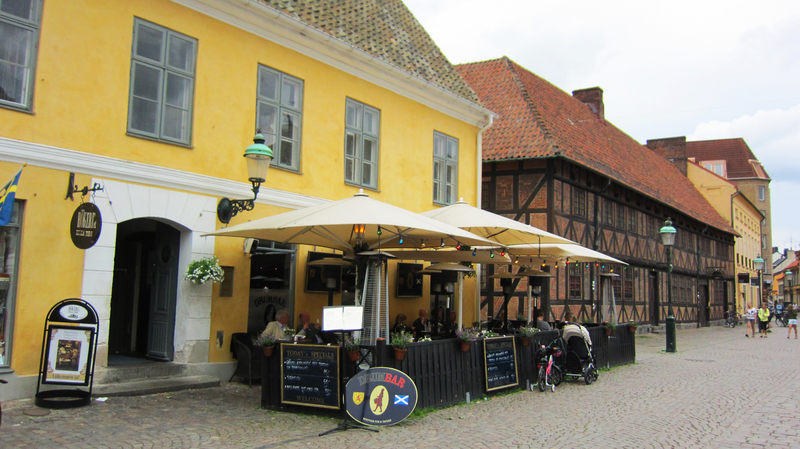 For scenery at Drumbar there are two outdoor seating options, on Lilla Torg (pictured above) where you can be part of the action on the charming historic square, or the quiet, interior courtyard that provides a more secluded experience. The interior is dark and cozy, perfect for a cold, rainy day. 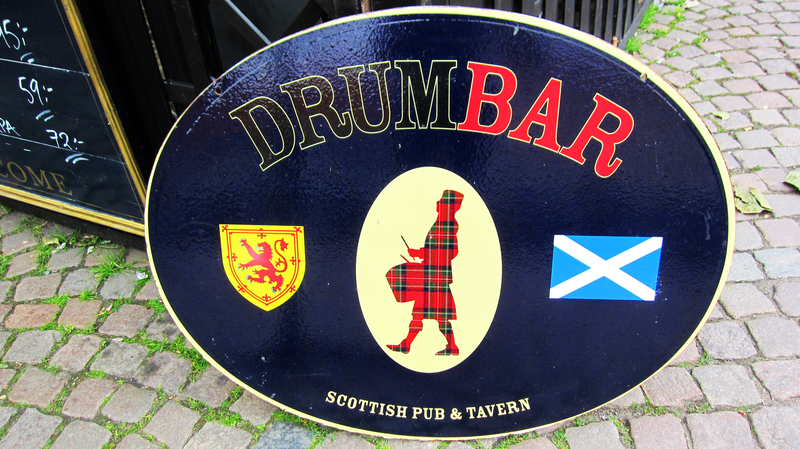 A bonus to Drumbar is the excellent, friendly service. Even though I just had the knuckle, I am already plotting my next one. My sister Mary and her family will be visiting us this summer and I have every intention of luring them to Drumbar. Mary, are you reading this? Have I awakened your inner carnivore? Maybe we can do a three-way split of a knuckle and try a haggis too…maybe. That sounds delicious! Thanks for the recommendation. When we go out to eat we don’t want to waste our money, so any great idea is highly appreciated!